I Heart Audiobooks – my books. my life. I am very tired after my nonstop weekend so here’s a pretty quick post about why I love audiobooks (because I WILL win one of Jen’s prizes :P). I discovered audiobooks late. It really wasn’t until this year that I really got into them. Prior to this year, I had an internal debate about whether audiobooks “count” and whether I get the same thing out of them. I definitely think they count now, but I don’t think you get the exact same thing out of print and audio. And that’s not a bad thing – it’s just a different type of reading experience. But the thing that sold me on audio? I can read SO MANY more books! and so many more places I’m sure. There are millions of books in the world and I want to read as many of them as I can. Audiobooks allow me to maximize my reading time. There are other things I love about audio, but this is THE reason I read them. And yes, it counts as reading. If you heart audiobooks as much as I do, you should definitely head over to Jen of Devourer of Books’ blog for Audiobook Week. And now I am off to bed. And yes it is 8:30. Hooray audiobooks! I love that you’re so motivated by the prizes that you’ll pull yourself to the computer and make yourself write something even when you’re bone-tired. It is going to be really funny though when I don’t win anything. Lol. That’s a really good idea to read during all those things. In fact, knowing I had something like that to listen to might make me actually want to do some of those things, like cleaning, haha. We’ll see… but I do think I should try another audio book. I’ve only listened to one ever. This contributes to how I can read so many as well. My life is pretty active and I have to fit it in when I can. 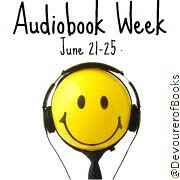 Audio Book Week is a wonderful concept! Audio books are definitely a way of getting more reading done, while working. I have a few audio books, but have never got around to listening to them – I read the actual books instead 🙂 I will have to give a try to audiobooks sometime. I’ve never audiobooked. *blush* Not unless you count picture books with tapes as a child. Do you ever find yourself getting distracted and have to backtrack? That’s what I’m concerned about- that I’d start daydreaming and miss a crucial point! I love audiobooks for the same reasons you mention. They, along with NPR podcasts, kept me sane when I was training for the half marathon. All those long runs were made much more bearable, and I got a bunch of “reading” done!